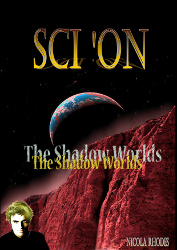 Let me start by saying that I enjoyed Nicola Rhodes’ SCI’ON – The Shadow Worlds – it did exactly what a fantasy novel is supposed to do, which is to provide an entertaining escape from the day-to-day tedium. I could knit-pick and find a few areas where the story could have been a little tighter, but I was turning pages so fast that I’ve decided it doesn’t matter since nothing reached the point of becoming a distraction. In SCI’ON – The Shadow Worlds, Rhodes takes the familiar “many worlds” theory and weaves together a tale that has her cast of characters jumping from world to world in an effort to reach the first world, SCI’ON and confront their nemesis, Talvas of Belleme. The story is told via two concurrent threads, and I was immediately hooked with the parallel stories of Ryan and Kai, and Johnny and Jez. The dialog is well written and often humorous, and never hinders the quick pace of the book. Rhodes makes it extremely easy to bond with her main characters, and it is done so well that a few minor problems with some of the “science” underpinning her story becomes irrelevant; besides, few authors ever deal well with time paradoxes, and I’m not about to fault her here since once you accept the “many worlds” premise, you’re pretty much committed to suspending your disbelief altogether. So to summarize, I think Rhodes has produced a very readable and entertaining novel. I put it into the category of Farmer’s The World of Tiers series or Burroughs’ A Princes of Mars series – light, entertaining stories that are a perfect escape. Often, this is all that is required of a book, especially on a nice summer day spent in a lawn chair. Rhodes’ bibliography can be found here: Smashwords.